Seborrhoeic dermatitis is very common and many people don’t even know they have it. Overall it has been reported to affect about 4% of the population and dandruff (which is mild seborrhoeic dermatitis of the scalp) can affect almost half of all adults. It's thought that seborrhoeic dermatitis is triggered by an overgrowth of a harmless yeast called Malassezia that lives on the skin, or an overreaction by the skin’s immune system to this yeast. Tiredness and stress can sometimes trigger a flare of seborrhoeic dermatitis. It's more common in cold than in warm weather and it's not related to diet. What does Sebhorrheic Dermatitis look like? 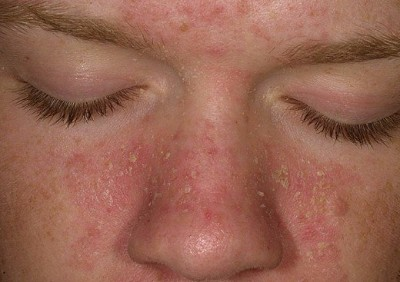 Red, scaling rash on the scalp, face, ears, eyebrows, chest and in the bodies skin folds. 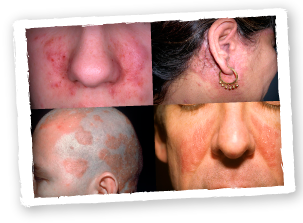 View further information about Seborrheic Dermatitis on the AAD website. There's no permanent cure but it can be managed with treatments that reduce the level of skin yeast, flaking, redness and irritation – these include creams, cleansers and shampoo which can be used safely on a long-term basis. Sebhorrheic Dermatitis Shampoo - For mild flaking use anti-dandruff shampoos or SESDERMA SESKAVEL Dandruff Control Shampoo regularly. For thicker scales they can be removed with descaling shampoos containing Glycolic acid, we highly recommend SESDERMA - SESKAVEL Glycolic Shampoo. Use shampoos to regulate sebum secretion and micro-organism growth. Regular use of shampoos such as SESDERMA - SEBOVALIS Treatment Shampoo or Sebclair Shampoo will improve erythema, scaling and pruritus. SESDERMA - SEBOVALIS Hair Solution is a treatment lotion, ideal for dry and flaking scalps. Salicylic acid (BHA) is a chemical exfoliator that dissolves the bonds between skin cells to help remove old tissue. For seborrheic dermatitis sufferers, exfoliation is critical to helping remove dead skin cells. Salicylic acid also has a calming, anti-inflammatory effect on the skin to help reduce the redness. View our salicylic acid cleansers & moisturisers. BHAs are not for everyone especially very sensitive and they can also be drying. Polyhydroxi Acid also offers the same benefits as BHAs but also strengthens the skin barrier and has added moisturising effects. Along with gentle skincare and a well-formulated BHA exfoliant, you can consider a topical treatment called Sebclair. Sebclair® is a non-steroidal range of clinically proven products specifically designed to manage the signs and symptoms of seborrhoeic dermatitis (SD), which has demonstrated both anti-inflammatory and antifungal properties. Sebclair® helps manage and relieve the itching, burning, scaling and pain experienced with seborrhoeic dermatitis. Apply Sebclair after cleansing then follow with a daytime moisturiser with SPF in the morning. At night cleanse, apply Sebclair and follow with a moisturiser. Oxygenetix foundation is brilliant for Rosacea and Eczema skin types at covering redness and calming the skin.